Hi everyone! Welcome to another Bellarific Friday with Stamping Bella! This week the team is working with the Squidgies category. 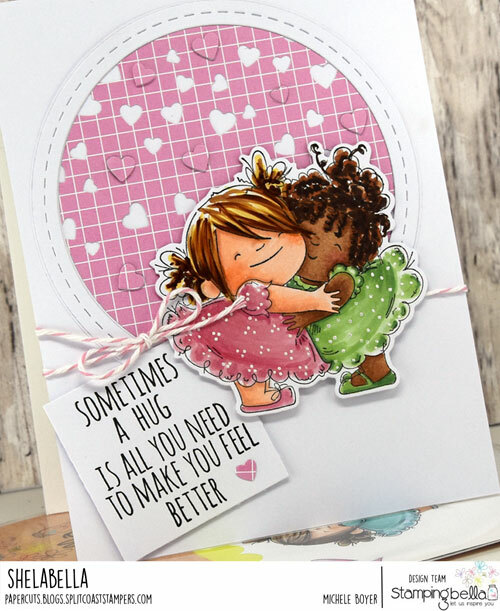 You may recall that Celebrating Squidgy is the December Stamp of the Month (also found in this post), available only a few more days at 25% off. Also on sale is the cooresponding die. The Squidgies were adhered over a panel of Falling Hearts, with several of the hearts left in place, popped up on bits of clear foam squares. There is no challenge next week as we’re taking a bit of time off. I will be here to share some things though so please check back! Thanks so much for stopping by!